Two fairly popular indie games, Salt and Sanctuary and Surgeon Simulator. The former is coming out in early August, while the latter is going to launch some time in the fall. Two very different games, but you certainly can’t say that the Switch doesn’t have something for everyone. Even more fairly high-profile games have been announced for the Nintendo Switch. 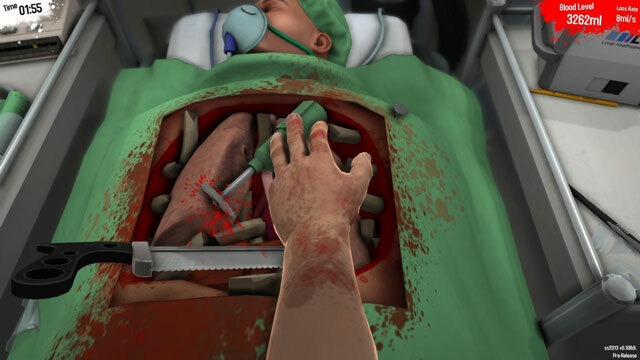 The first one is Surgeon Simulator; specifically, Surgeon Simulator CPR (short for Co-op Play Ready). The Switch version of the game was first announced earlier in the month, via a clever little trailer on YouTube. According to Eurogamer, Surgeon Simulator is going to come out on the Switch some time in the autumn. And, yes, it’s going to feature the co-op mode. The game is intentionally clumsy and annoying to control; now, imagine the pandemonium that you can unleash with two players fumbling with dangerous surgical equipment. The other game is Salt and Sanctuary, the trailer for which you can check out below. Long story short, it’s a 2D Souls-like game. It features standard platforming, but adds combat that’s reminiscent of Dark Souls to a degree. As you can see in the trailer, there’s dodging and waiting for the opportunity to strike back. This especially goes for the gigantic, somewhat overdesigned but still cool, bosses. Those are usually the coolest part of any Souls-like game, and Salt and Sanctuary is no exception. Oh, and there’s also local co-op multiplayer. The Switch version of the game is coming out on August 2nd, and it will cost $17.99. The developers have also announced a physical edition, too, called Salt and Sanctuary: Drowned Tome Edition, which is coming out later in the year. As I’ve said before, it’s really great to see that Nintendo is really keeping the promise of making the Switch a haven for indie games. I am worried that the poor console is going to get clogged with too many releases, like Steam did. I really hope that won’t be the case; we’ll just have to wait and see.